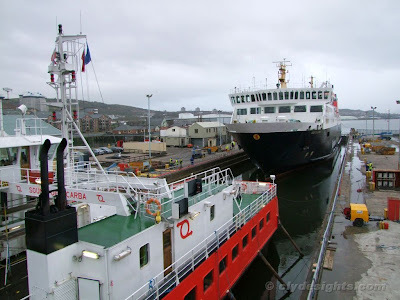 Sharing the Garvel drydock are two very different ferries, both built just a few miles to the east at the Port Glasgow yard belonging to Ferguson Shipbuilders. SOUND OF SCARBA arrived in the dock yesterday evening to commence her annual overhaul and Passenger Certificate renewal survey. 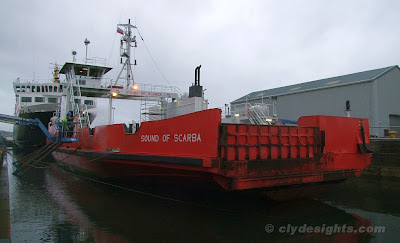 Having successfully entered the drydock this morning, ISLE OF LEWIS is sharing the drydock with SOUND OF SCARBA. As can be seen, she is one of the Garvel's larger customers. It takes between three and five hours to pump out the drydock, during which time the timber shores - seen hanging between SOUND OF SCARBA and the dock side - are positioned as required to help steady her while she sits on the keelblocks in the dock bottom. Being flat-bottomed, ISLE OF LEWIS does not need side shores, but is supported on additional blocks placed under her hull.